Spam Rats is fortunate to have a large data collection grid of specialised mail servers which are used to feed data into the various Spam Rats databases, as well as our team of specialised Spam Auditors. This isn't meant to catch every spammer, trojan, or bot out there, it primarily registers the most aggressive and active ones. If your server happens to leak only a couple of Spam, it is unlikely that you will find your IP listed, however if your IP is spewing spam, attacking many locations at once, or other specialised patterns that identify abusive behaviours, (or in some cases, you simply have no controls preventing outbound Spam), then you might get on the lists. However, it is helpful to see exactly how effective our data collection grids are, how effective the lists are in the real world, and just how bad the problem of trojans, bots, and infected PCs can be. For more information, media interest, technical interest, or for partnering with our technologies, please use the contact page, and hopefully this real time information, may provide interesting information for you. Coming Soon! Real Time Blocking Statistics. 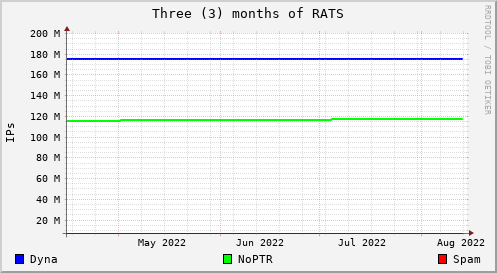 However, in the mean time, as of Sept 15, 2015 an indicator of the effectiveness can be seen by looking at what a typical ISP of about 10,000 users shows that just RATS-SPAM and RATS-NOPTR reject 73% of inbound attempts. Generally, the more domains you host, the more effective these lists are. Larger ISP's have more targeted email marketers, rather than spammers, and MIPSpace may be more effective (18%) for this. Remember, 75% of connections from the worst offenders actually means stopping a lot more spam, as those attackers tend to send a lot more spam per connection. IP reputation really helps. It is simple math. There are 4,162,314,256 IP Addresses (IPv4) possible, of which 660,813,928 are BOGONS, i.e. not used for public IPs. There are even less actually assigned for use, and when you subtract those that are reserved for purposes that don't involve the possibility of sending email, we just have to watch less than 2 billion IP Addresses. With our technology, that isn't quite as hard.